Allan Sherwin (BA '64), MSc., CEC, CCE, FMP, is the fourth generation of a family that has been in the restaurant and baking business since the early 1900's. 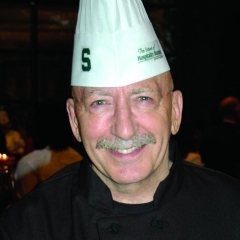 He has owned award-winning restaurants and has a Bachelor's degree in Hotel, Restaurant and Institutional Management from the Honor's College in 1964 from MSU and a Master's degree in Food, Hotel and Tourism from Rochester Institute of Technology in Rochester, New York. He is certified as a Chef de Cuisine from The Midland's of England Chefs Association and a Certified Executive Chef and Culinary Educator from the American Culinary Federation. He is also certified as a Food Management Professional and an instructor in Foodservice Sanitation from the Educational Foundation of the National Restaurant Association, and in wines from the British Wine Trust in London. Chef Sherwin has been Director of Culinary and Hotel Programs at Stratford University in Falls Church, Virginia; Santa Barbara City College in Santa Barbara, California; The University of Montana in Missoula, Montana; and Paul Smith's College in Paul Smith's, New York. He was Director of Culinary Education at the Paul Hall Center for Maritime Education in Piney Point, Maryland in charge of training chefs on American registered ships throughout the world. Chef Sherwin is the author of several professional papers and publications. He served in the Marine Corps as a Naval Flight Officer and flight instructor in F-4 Phantom aircraft. The research by hospitality scholars suggests people generally fit into certain wine-drinking categories or “vinotypes." Allan Sherwin's professional journey taught him how to be a leader, mentor, and teacher.